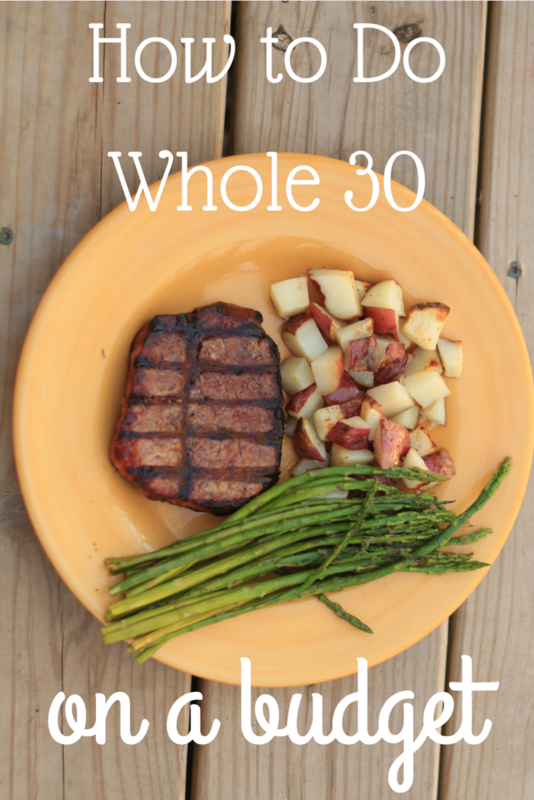 When I decided to do another Whole 30, I knew that I had to do some things very differently. One of them had to be cost. My first whole 30 (whole 25, really) was last May and during that month, I went over double my grocery budget. Oops. I honestly didn't pay attention to the money portion of it at that time because I wasn't as concerned about it and didn't need to pinch pennies as closely then as I do now with the adoption. This time, doubling my normal grocery bill was not an option for me, and I knew I could do it without going over, so here is how I did! This first tip is going to save the most money but is going to be the most unpopular amongst the whole 30 community. I skipped buying grass fed and organic meat. In some regions it may not be that much more, but here it is about double the price for grass fed beef, and sometimes up to 4 times as much for organic chicken. No wonder I went so far over my budget last time! We also eat so many eggs-usually at least 5 dozen a week. I would love to be able to afford all free range, organic eggs, but that would put us at $25 a week JUST on eggs. Again, I know this isn't what the program would recommend, but if you are really looking at doing whole 30 on a budget and can't afford these things, it will make a huge difference in price. The next thing I did was snack less. Technically on whole 30, they don't really like you to snack at all, but sometimes it is inevitable. Last time, I still snacked quite a bit and whole 30 compliant snacks aren't going to be cheap. A bag of nuts is anywhere from $6-$12 a bag or more. A Larabar is $1.50. If you are eating that stuff every day, you might be looking at an extra $20 or more a week just in snacks. Something else that I think really helped was to make simple meals. Last time, I didn't make super intricate meals, but I did try out a few new things that needed new ingredients. So I would be buying an $8 bag of arrowroot powder just to use 1/2 a cup from it and never use it again. Silly. Sticking to more simple meals (meat, fat and produce) can really help cut down some of those costs. I think the last thing I was more conscious of this time was to buy seasonally. I know a lot of people already try to do this, and I do it somewhat (i.e. I don't buy $7 containers of strawberries in the winter.) but last time I just bought what I found in recipes and what sounded good. You are going to pay a lot more for a spaghetti squash in the spring than you would in the fall. That's just how it is! Buy seasonally, and you will keep your produce prices lower. I am thrilled to have kept my whole 30 on budget this time around and I honestly can't believe it is already over! The month just FLEW by! Any other tips for eating whole 30, or eating clean on a budget?